Ginkgo has hardly been questioned as a remedy for brain boosting, however reviews and studies are quite conflicted in some cases when it comes to the effectiveness of ginkgo biloba memory enhancing supplements. Because of its purported ability to increase the flow of blood to the brain, ginkgo biloba extract is thought to be able to boost memory function and cognitive ability while also staving off the effects of degenerative diseases like Alzheimer’s. Some major studies have shown ginkgo biloba memory benefits to be plentiful, while other similar studies found there to be no gingko biloba benefits to cognitive function and memory. Chinese medicine has used Ginkgo biloba tea and supplements for centuries, although for a variety of conditions aside from the common brain boosting abilities that most are familiar with. It seems that the jury is still out as to whether or not ginkgo biloba memory benefits are genuine or not. The good news is that you can safely try out ginkgo biloba for yourself easily and with little risk of adverse side effects. In fact, ginkgo is extremely common in many supplements and even sports and energy drinks. 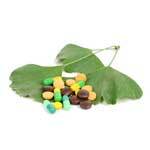 There are, however, ginkgo biloba side effects that you should be aware of when trying this common herb for yourself. Heart palpitations have been reported, as have dizziness, gas, diarrhea and nausea. People with bleeding disorders, diabetes, those prone to seizures or fertility problems should not use ginkgo biloba memory supplements, or products containing this ancient herb. As with any medicine, natural remedies can cause reactions and health risks that you may not be aware of. As such, their use should be practiced under the supervision of a health care provider. You should discuss your natural supplements with your physician before use to ensure that you do not take medications or have health conditions that might be adversely affected by this natural remedy. While studies conflict regarding the effectiveness of gingko biloba as a brain booster making a definitive review difficult, circulation issues and menstrual issues both have shown evidence of being effectively treated using ginkgo, meaning there may be more to this ancient Chinese remedy than meets the eye.